What does it take for the Georgia Dome to get ready for these 10,000-pound trucks? Staging the Georgia Dome to host Monster Jam requires slightly more effort than gearing up for a football game. Instead of overgrown men clashing on the field, the jam sends 10,000-pound trucks—each at least double the height of a Ford F150—into brutal collision courses, crushing cars in their wake. Preparing for the battle of these behemoths is no small undertaking. hours is required to prep and clean up. gallons of fuel is needed to power all the vehicles. square feet of plastic is spread to protect the playing field. (regular-sized) cars are crushed during each show. truckloads of dirt (7,500 tons) is used to create the track. 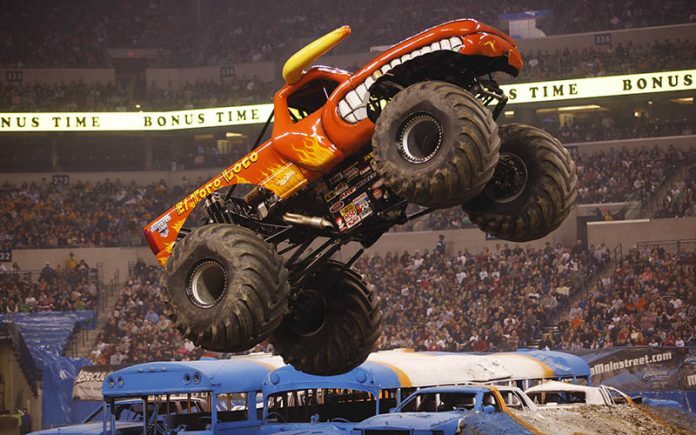 On the calendar Watch ginormous trucks like Grave Digger and War Wizard crush it at the Georgia Dome on January 10. This article originally appeared in our January 2015 issue.